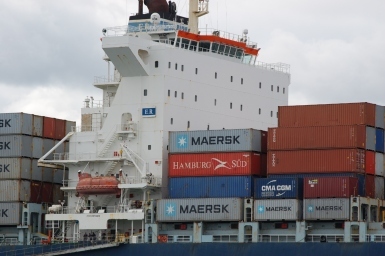 Uwe-Peter Schieder, Loss Prevention Manager at GDV (German Insurance Association – Gesamtverband der Deutschen Versicherungswirtschaft) and Vice-Chair of IUMI’s Loss Prevention Committee, provides his comment on securing containers on deck of a container ship. Mr. Schieder says that there are six different motions in which vessels move in the sea, with the main of them being pitching, heaving and rolling. However, lateral rolling motion presents the greatest risk for stacks of containers. In order for containers to be safely transported on the deck of a container ship, this must be done with the help of twistlocks. These are inserted into the corner castings of the containers, which have elongated holes. There, the rotating lug of the twistlock engages locks the containers together. Moreover, the bottom two layers of the stacked containers are connected to the vessel via lashing rods. Today, each stack is separate, in order to be stowed or unloaded independently of nearby stacks. The lashing rods are arranged crosswise in front of and behind each container stack and absorb lateral movements of the stack. Based on the planned height of the container stacks on deck and their permitted weight, the fifth layer of the stacks are secured at the bottom by the rods. In order for these rods to be attached, vessels have lashing bridges across the ship between the rows of containers. The lashing systems are calculated individually for each ship by specialist companies and are inspected and approved by the classification societies. These calculations are then recorded in a Cargo Securing Manual, which is approved by the flag state and includes all the necessary details. A very important factor is the weight of the containers, as the higher a container is in a stack, the less its weight should be. However, Mr. Schieder notes, the securing balance can be affected by the cargo in the container, due to the securing systems on board being calculated assuming that the dynamic behaviour of the cargo is neutral. Static masses are assumed for the containers, while it is also assumed that this mass always acts the same way in the container. What is more, the extent to which a vessel rolls in the swell also depends on its stability. Stability is the ability of a ship to correct itself after an external force applies pressure to it. A ship with high stability will right itself quickly, and a ship worse stability will need more time. Nonetheless, the stability should not be too much or too little stability is dangerous, as high stability leads to high acceleration, while low stability could cause the ship to capsize. Now, the securing systems of a container ship are designed based on longitudinal, lateral and vertical acceleration values, which are calculated via formulas of the classification societies. These are created according to swell statistics and transfer functions for ship behaviour. Due to the fact that container ships are getting bigger, faster and have more container stowage height, these formulas are constantly changing. In addition, the actual amount of acceleration that swell is causing depends on the characteristics of the ship and the swell itself. Most often, the larger the ship, the less likely it is to be caught in seas that will cause it to move violently. However, there is an exception which regards rolling movements. In case that small stimuli strike the ship repetitively, the oscillation will be reinforced. This is called resonance and works in a similar way children swing higher. This causes large roll angles and large lateral acceleration. This situation can be even more evident, when the swell strikes the ship transversely or at an angle. Furthermore, there is another form of rolling motion, which can happen because of periodic fluctuations of the ship’s stability in a longitudinal swell. Taking into consideration the stability parameter, this form is called parametric excitation. Practitioners consider it insidious, as it was believed that rolling oscillations could be limited by steering into the swell. Finally, technical aids for detecting resonance in a timely manner are being developed, but a decisive breakthrough has not been reached as of yet.